Another hot summer’s day found us parking in Whitchurch off the A40 near Symonds Yat. A short walk across the A40 by a road bridge and there was a footpath which brought us to a lane heading south. All too soon we found ourselves climbing which seemed a little odd as we were making our way to the River Wye in order to cross it via the ferry. Arriving at Ferry Inn we were disappointed to find that the ferry wasn’t working but our contingency plan was to walk along the western bank of the river. Imagine our delight when after walking about ½ mile down river we found that the second ferry opposite the Saracen’s Head was about to leave the shore on the other side. This is a rope or hand ferry joining Symonds Yat East and West. Ferries like this were vital, in the past, linking the communities on both sides of the river. We paid our £1.20 a head and boarded; the river was so low after the extended dry spell that a box had been placed on the boat to ease stepping down to the ferry. The ferryman sang as he took us across in memory of ‘the singing ferryman’ who died in 2011. On reaching the other side we went through the large car park at the foot of Symonds Yat Rock. Peregrine falcons can be seen at Yat Rock from early spring. Now we were following an excellent footpath and cycle way alongside the Wye with trees providing shelter from the summer’s heat. The brooding presence of hillforts built by Iron Age tribes, commanding wide vistas high above the Wye, reinforces the feeling that this has been border country for millennia. Tourists discovered the beauty of the Wye in the 18th century when it became fashionable to take the Wye Tour and find inspiration in the picturesque viewpoints. After a while we came to the chain bridge. Six people at a time can cross. We waited patiently each side taking turns, the second half of our group found that 5 cyclists joined us when we were halfway across and the bridge started to bounce a little alarmingly – not good for those of us who have problems with heights. though we had crossed the river, we were on the eastern side of the river again as there is a loop here. Now we were headed north. After about a mile we turned right up a steep hill through woodland and just before reaching King Arthur’s Cave turned left out into the full heat of the midday sun and continued upwards to a hillfort. Lunch at the top of Little Doward hillfort gave us views to the southeast with the river far below us out of sight. Towering 724ft above the River Wye, with steep cliffs on three sides the Little Doward provided the ideal site for an Iron Age hillfort. It was improved only by the construction of a single massive rampart around the enclosure. Recent archaeological exploration has found that people here lived in circular platform houses. They worked animal bones, making items like toggles and dice, which were found during a dig in 2009. The limestone bedrock has enabled the preservation of bone here. We descended the hill, circling to reconnect with our original path and travelling northeast. Soon we were at King Arthur’s cave. Victorian and Edwardian naturalists were fascinated by the Doward Hills. 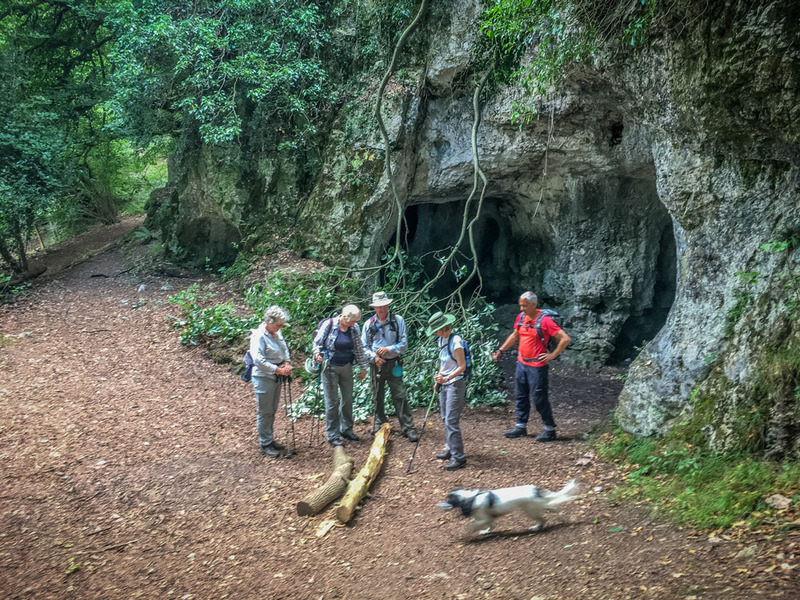 This large limestone cave held a particular draw. Excavations reveal that people have used this cave for 20,000 years. Prehistoric animal bones – of hyena, rhinoceros, bison, lion, bear, reindeer, horse and giant deer – were discovered 11 feet below the caves present floor. Large openings allowed those of us who were interested to explore the caves without ducking, some had torches and further caves appeared as we continued. Did King Arthur really come here, we wondered. Continuing downhill via steep lanes we were soon passing through Great Doward and found our way back across the road bridge to Whitchurch. This was a lovely walk much of it easy – especially the ferry ride – 7½ miles and 1200ft climb. A small delicatessen supplied us with cups of tea and the bar of an Indian restaurant had beer so we were all happy.